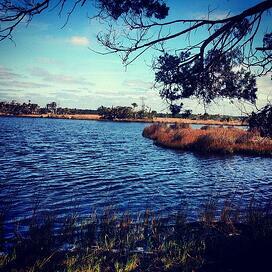 More than 60%, nearly 9,000 acres, of Nocatee is dedicated to the preservation & conservation of the natural environment. The Nocatee Greenway and the Nocatee Preserve are two examples of this commitment to protect and sustain the natural beauty. The Nocatee Greenway Trail System encompasses over 5,000 acres of environmentally sensitive areas that run throughout the community. The lands provide migratory routes for wildlife living in Nocatee, and afford residents the opportunity to encounter nature through its extensive trail system that can be traveled via bike, EV-cart or foot. The Nocatee Preserve is a hidden jewel that protects over 2,400 acres of North Florida’s most diverse ecosystems. This environmentally sensitive land stretches 3.5 miles of the Intracoastal Waterway, offering up a variety of recreational opportunities to hike, kayak, canoe and fish, while exploring this preserved land. To learn more about Nocatee's commitment to preserve for generations to come, stop by the Nocatee Welcome Center or call 1.800.NOCATEE.